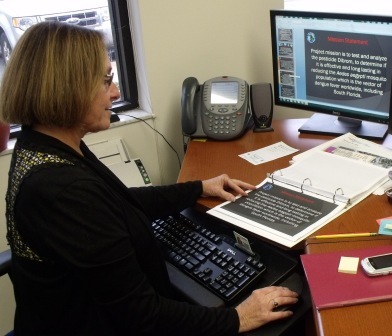 Barbara Golden is a State of Florida employee with the Florida Department of Military Affairs (DMA), serving as Administrative Assistant II at the Camp Blanding Joint Training Center. She was submitted for the Governor’s Spotlight recognition program. Barbara Golden, prepares and reviews mission essential notebooks and documents for accuracy concerning a C-130 aircraft aerial spray mission at Camp Blanding. Her administrative experience, consistent display of outstanding support and dedicated work ethic are indicative of the great asset she is to Camp Blanding. “This documentation is an accurate display of all information needed to successfully accomplish such a high profile mission using a military C-130 aircraft, ” stated Jerry Kerce, environmental specialist II and spraying program coordinator with the Florida Department of Military Affairs. According to the Department of Military Affairs Human Resources Director Joe Camit, Barbara has performed her work consistently and exceptionally with the Camp Blanding Forestry and Environmental Section. She has proven herself, time after time, providing exceptional service with dedication and loyalty expected by the citizens of the State of Florida, the Florida National Guard and the Department of Military Affairs. About the Florida Department of Military Affairs.The Florida Department of Military Affairs provides management oversight of the Florida National Guard, and provides units and personnel ready to support national security objectives; to protect the public safety of citizens; and to contribute to national, state and community programs that add value to the United States of America and to the State of Florida. The Department of Military Affairs, a state agency created by Chapter 250, Florida Statutes, oversees and provides administrative support to the Florida National Guard. Directly responsive to the Governor of Florida, the Department and the Florida National Guard together operate within the policy guidance and fiscal framework of both federal and state authorities.